There are few things that have the capacity to bind a nation together, and bridge boundaries drawn by religion, caste, education level, social class, status, power, you name it. Cinema is one of them. It’s a beautiful blanket woven in a myriad of colours, with strands of multiple cultures. Most importantly, it manages to speak, and we mean really ‘speak’, to the audience today. Those who are part of cinema, Bollywood especially, command respect and are cherished forever as not just entertainers but iconic characters who touch minds and hearts. But how easy is it to get a foot in the door to Bollywood? Is the surname still more important than talent and creativity? No one can answer these questions better than a man who has made a name for himself, by himself, in Bollywood in the recent past. Ayushmann Khurrana is not just a talented actor, singer and anchor, but also the co-author of a wonderful new book – Breaking the Bollywood Code. A labour of love by both him and his wife Tahira Kashyap, the book aims to give readers a reality check of what getting into the film industry is all about, and what actually gets young contemporary actors going today. ‘But he’s just started his career, isn’t it too soon?’ is one of the first questions that would strike anyone’s mind. But Ayushmann was ready with an answer for that. “We had a story to tell and was aimed at those who are struggling in the industry at the moment. ThIs is about the struggling pattern in the country when it comes to upcoming actors. Formerly it was like a fortress. Now the industry has become more democratic. Every year there’s going to be new talent coming into the modelling and TV industry. I’m glad this trend has changed”, he quips optimistically. So it’s pretty evident that there’s a bit of a struggle involved. For Ayushmann, the toughest mountain to conquer was his entry into films, and the transition from television soaps to cinema. “I did daily soaps for a brief while, a lot of people discouraged me. You get exposed on television and never get a break on the big screen. But there’s no formula to success. I was a popular face on TV when Vicky Donor auditions were on,” says the star. He’s not blind to the luck factor, though – “Most times you need to be at the right place at the right time. There are a lot of people who are extremely talented but are still struggling,” admits the actor. By the end of the session, the discussion had panned to the idea of topical, niche films and the importance of content. According to Khurrana, content is and always remains king, event in Bollywood. “You need to create a niche for yourself. 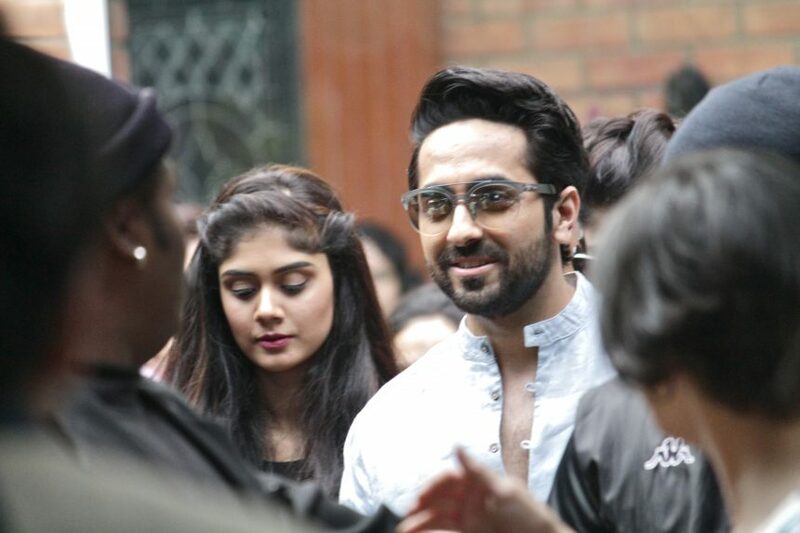 I plan to do films that are content based and support my liking for music as well”, says Ayushmann. A great piece of advice right there for budding artists and actors to be. So you ask yourself, acting, success, all part of the big game. But what about the book? What does it take to release a story like this? Turns out, you always need a little help when you take up a big venture like this, and who better to help you out than your significant other? “When it comes to his story and the book, predominantly I was on it hands on. But we were always connected. At no juncture did I feel it was mine; it was both of us. The only conflict we had was the conflict between being an wife and a co-author. Professionalism is what is needed when such issues arise,” says Tahira. More inspiration for people who want to work together on their own works of art out there.